Epsteins Guesthouse officially opened to the public in October 2003 . Yes, you've guessed it, everywhere you turn in this magnificent house you are reminded of the fab four - The Beatles, and of course Brian Epstein. A copy of the public record and other evidence is on display within the house. Apart from the famous décor, Epsteins comprises of three stories with nine guest rooms, each with it's own En Suite facilities. The number of beds available varies from room to room - the total capacity is 25. All rooms are en-suite with tea/coffee making facilities. On the ground floor the entrance hall leads into the lounge, where there is a large screen T.V, comfortable seating and dining facilities. The bar is fully licensed and is made available to our guests throughout the day & night. The French doors lead directly onto the patio and huge garden. The former home of legendary Beatles manager Brian Epstein is situated in the Anfield district of Liverpool, within a stones throw of Liverpool Football Club's Anfield Stadium and a 5 minute walk from Goodison Park, home of Everton FC. The location and history of the Guesthouse make it an ideal place to stay when visiting Liverpool for work, tourism and sport. There is a video posted on that Guest House, recently renamed The Brian Epstein Hostel. The "Brian Epstein Hostel" (formerly called "Epstein's Guest House" before its recent sale to another owner) is located at 27 Anfield Road, Liverpool and was formerly the home of Brian's GRANDPARENTS ~ Isaac and Dinah. Brian never actually lived there ~ his parents, Harry and Queenie, were given a house (as a wedding present) approx. a mile away from there, at 197 Queens Drive in Walton, Childwall, Liverpool BEFORE Brian was born, and that's where he grew up. I'm a bit disappointed that the people who run the Brian Epstein Hostel can get away with this ~ not actually lying, yet subtly deluding the public that this was Brian's family home. No, it was where Isaac and Dinah lived. Harry grew up there, not Brian. Be that as it may, it seems to be a lovely place to stay, and I've got an LJ friendslister who plans to stay there in May during her trip to Liverpool ~ she will also be visiting London and various parts of Europe. She promises to report back to us. Thank you for your post, Eppylover. I shortly discovered you had already posted a video in another section of the forum as it is the same building (hostel/guest house) as on the video. I read your comment on the video, as you defined the accuracy of the guest house. I then came back here with the intention of removing my post. As you had explained it more in detail, it gives the public a clearer AND truthful history behind it in relation to Brian Epstein. At least, the public can view a home that is related to the Epstein family, though not Brian. I see what you mean.Thanks again. 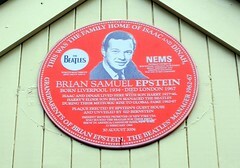 PA, The former family home of legendary Beatles manager Brian Epstein has been turned into a bed and breakfast. The detached house in Anfield, Liverpool, is now taking bookings from fans of the Fab Four from across the world. Epstein's grandparents Isaac and Dinah lived in the property from 1927 until 1946, according to electoral records. His father Harry also lived there until 1933. Current owners Darren McLennan and Ian Quigg planned to turn the property, which they bought for 36,000, into a nursery until they discovered its history. Mr. McLennan said: "We are both builders and we were doing a bit of work on the property when a neighbour came over and told us who used to live in it. "I couldn't believe it so I went to Liverpool Museum and looked it all up on the archives." The bed and breakfast, called Epstein's, opened for business at the beginning of December. In their first two weeks they received more than 20 bookings. Mr. McLennan added: "There are thousands of visitors from all over the world to Beatles attractions in Liverpool every year. We are hoping to tap in to that market." The childhood homes of both John Lennon and Sir Paul McCartney are open to the public. This year more than 7,000 people visited the properties, which are owned by the National Trust. Epstein guided the Fab Four to success after meeting them in the NEMS record store in Liverpool city centre. He died from an overdose of sleeping tablets in August 1967, aged 32.
hangs on the Epstein Guest House. "THIS WAS THE FAMILY HOME OF ISAAC AND DINAH. GRANDPARENTS OF BRIAN EPSTEIN, THE BEATLES MANAGER 1962-67. BRIAN SAMUEL EPSTEIN, BORN LIVERPOOL 1934 DIED LONDON 1967. ISAAC AND DINAH LIVED HERE WITH SON HARRY, 1927-46. HARRY'S ELDER SON BRIAN MANAGED THE BEATLES DURING THEIR METEORIC RISE TO GLOBAL FAME, 1962-67. PLAQUE ERECTED BY EPSTEIN'S GUEST HOUSE AND UNVEILED BY SID BERNSTEIN, EMINENT SHOWBIZ PROMOTER OF NEW YORK CITY, WHO BOOKED THE BEATLES FOR THEIR FIRST SHOW IN AMERICA, CARNEGIE HALL, NEW YORK. 12 FEBRUARY 1964. 30 AUGUST 2004."